"More books! More bananas! Let's do We Are in a Book. That one I want!" We're big fans of Elephant and Piggie around here. For weeks after we returned this one to the library, anytime anyone said "banana," Benjamin said "Banana! So funny! Ha ha ha! Hee hee hee!" In this installment of Mo Willems' easy reader series, Gerald and Piggie discover that they are in a book! It is very funny, and very meta. They're hanging from the speech bubbles, counting down the pages, and saying "banana." Really, it's a must-read. 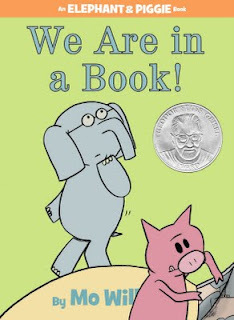 Shiny sticker is the Theodore Seuss Geisel Award. Previously: What I thought of the series more than two years ago. A rare case of a series in which the books continue to get even better as more and more come out. I'd go so far as to say "We Are in a Book" is the best E&P book yet! Willems is knocking them out of the park.